Last week I did a watercolour demonstration for Hythe Art Society in Kent. It was their 50th anniversary and the event was held in the baronial hall of Lympne Castle, a grand place with marvellous views across to the French coast. It was followed by a splendid cream tea – a most enjoyable occasion, and what a lovely art society! May their next 50 years be a great success. 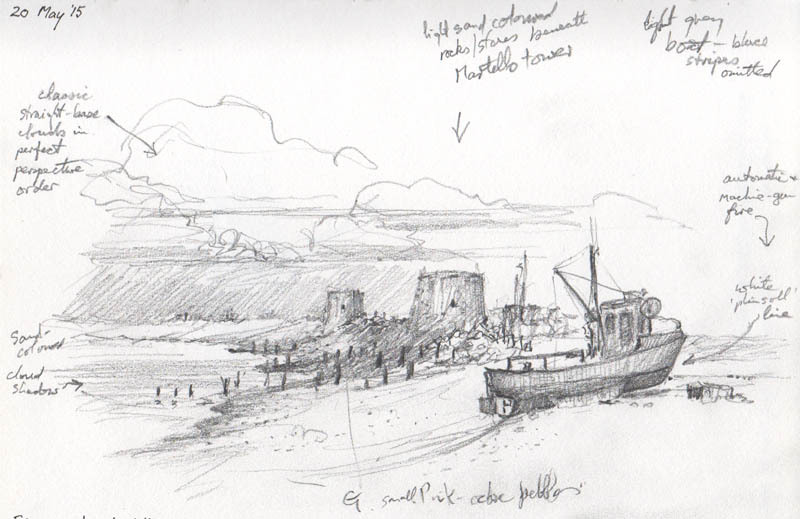 Naturally I was keen on taking the opportunity while on the Kent coast to do some sketching, and though there was not much time I managed a quick pencil sketch of the fishermen’s beach at Hythe. The fishing boats were backed by a couple of the old Martello towers that run along the coast, thus giving it a touch of local flavour. As you can see, I included quite a few written notes on the sketch to remind me not just of colours, but any other useful information such as the uniform level of the base of the clouds which was very marked and the whole revealing an obvious diminution in the size of the clouds as they receded into the distance. Tonal values were also important with the main shadow area over the closer tower, so I have emphasised this. 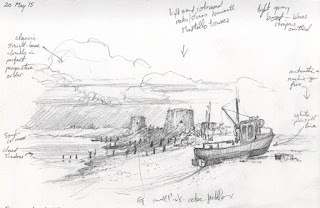 Notes on observations can be of enormous help to the artist, and even if you are not sketching it is worthwhile keeping a notebook in your purse or pocket to add to any photographs you may take. Sadly the fishermen’s livelihood is now threatened by building taking place to the right of the picture. Next week I shall be demonstrating at the Patchings Art Festival in lovely countryside just north of Nottingham. My appearances will be at 1pm on Thursday 4th, 1pm on Friday 5th, and 11am on Saturday 6th, with each demo lasting around one hour, so do come along if you are attending the festival. I shall be using the brilliant Saunders Waterford High-white papers made by St Cuthberts Mill. Hope to see you there!